It all started with a whacked out kid, a desperate mom and a crazed, destructive cat. I'm Emily J. Parnell, author and mastermind of the Secret Society. Okay, I'm really just a mom, a designer, and a writer, but when you create a secret society, you get to call yourself cool things like "Mastermind" and "Agent E" and develop code words and all that. Why did I create a secret society? Well, I'm glad you asked. See, I have two kids. A daughter and a son. (That boy is full of vim and vigor, my grandmother would have said.) It was just after Halloween, and my daughter's best friend told my sweet girl about something called a Switch Witch. The Switch Witch, evidently, exchanges toys for candy. I'll paraphrase, as it is a long story, but in short, the ultra-magical gift that the Switch Witch entrusted to my daughter, along with explicit instructions (on paper with burned edges in fancy script writing, I might add) to care for it with the utmost care, was irretrievably dropped into the freezer case at the local Trader Joe's. As "the Switch Witch" searched desperately online for a replacement, so as to mend my daughter's broken heart, my son hissed in my ear, "I know it's you." Those words make the blood in your veins run cold when you're a mother fond of creating elaborate seasonal magics, do they not? And so, I sat down and laid upon my 9-year-old son, the Mysterious, Maybe Awful Truth. Huge tears welled in his eyes, rolling down his cheeks. "Is everything like this?" he asked, as my heart shattered. "Santa? The Easter Bunny? Is God like this too?" A million question marks filled his face, as well as sadness and disappointment. Now my son, bless that boy's heart, is a firecracker. He doesn't do nothin' halfway. When he falls into a deep depression over learning the truth about Santa, he decides to bring the whole house down with him in flames, leaving all of us collapsed into a heap of twitching nerves. (During this time, I frequented the same Trader Joe's, that started this whole mess, for two-buck-chuck to help ease the madness.) It didn't matter what my husband and I told him, he just knew that Christmas was ruined, and that nothin' good would ever happen again. Never. Ever. Finally, in early December, walking down the hallways of his school, I saw his class project, a letter to Santa. He wrote, "Dear Santa, I want a cat. But my parents say I can't have one." In a last-ditched effort to revive his spirits and save Christmas (and restore sanity to our household), my husband and I agreed to get him a kitten. Thanks to connections my dear Uncle Jim has (wink, wink), Santa HIMSELF delivered the kitten to my astonished children. She was named Mittens. Mittens is violent. She bites my ankles every morning, frequently drawing blood, scratches the paint off our walls (are you aware that declawing cats is no longer considered acceptable? ), has actually torn huge hunks out of the wallboard, and stalks our poor beagles so as to bite and claw their ears and eyeballs. Perhaps she will outgrow this "zany playfulness," but until that day, I shall bleed and yowl each morning. At which point, I thought, "There must be a better way!" And so, I set out to create something new. A tradition for when they outgrow their shelf elf. Something based in truth, yet still fun and intriguing. A way to teach them the joy of Christmas, and the magic of giving. From this effort came the Society of Seasonal Secretkeepers. Something that might save others from a blood-thirsty devil cat. Knowing that the more input I took (Ack! Do you have any idea how hard it is, as a creative professional, to try to please the masses?) , the better this project would be. I rounded up two of my smartest friends, a school teacher and an editor, to round out the talent for this project. (Applause for Janie and Susan!) And then, as much as it makes me a little crazy, I knew my mom would have lots of tedious, but amazing input, so I asked her for her two cents. The result is, well, might I brag? It is amazing. We are SO darned proud of our finished product. The token is gorgeous, "It feels like magic money!" my son said, and it's the type of treasure that children will squirrel away in secret places for years. (We wouldn't settle for anything less, and it was made in the US by a company owned by a veteran, to boot.) The book has all the little touches that would have intrigued me as a child. A secret mentor. (Don't tell them it's just me!) A secret society. Secret missions. And a sense of Empowerment that a child so craves as they start growing up. Speaking of my opinion - I've mentioned the importance of teaching my values to my children, and I know you feel the same. However, you and I could have totally different values, couldn't we? That's why our team worked together to provide a neutral viewpoint. It's a springboard for discussion, and a chance for YOU to impart your own values on your kids. And, oh, hey, what if they aren't actually your biological children. Or if you're a single parent, or foster parent. Or two dads or two moms. We were thinking about you too. The Field Guide is written with instructions for kids to talk to their "grown-ups." We wanted this guide to fit for pretty much any family. If we missed your situation - holler. We'll rewrite it just for you. We hope your family will enjoy The Society of Seasonal Secretkeepers Field Guide: Ancient Secrets for Modern Kids. I wish I'd had it for this transition with my son. Although, I admit, the cat is growing on me. You might go ahead and get a kitten in addition to the gift set. Don't let this happen to you! 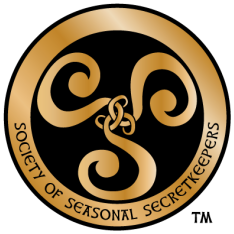 Order The Society of Seasonal Secretkeepers for your child now!